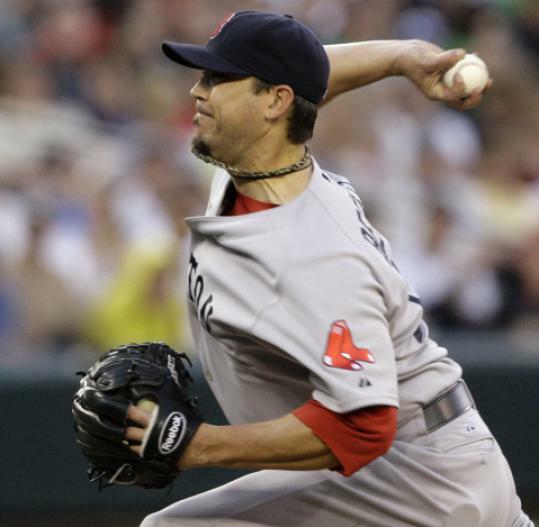 SEATTLE — As the question was asked, a hint of a smile played across Josh Beckett’s face. He answered, his pause emphasizing what came next. “A long time,’’ he said, when asked how much he’d been looking forward to getting back on the mound, to trying to rectify a season that had gone awry over the first month. It was with that anticipation in mind that the Sox watched Beckett throw a 94-mile-per-hour fastball to Ichiro Suzuki in the first inning last night, the first pitch he’d thrown in a major league game in more than two months. He was last seen walking off a rain-soaked Yankee Stadium mound May 18, a time when no one believed it would take until nearly the end of July to see him again. And, given that lengthy period away, it was all the more impressive what Beckett was able to do last night. Even though he did not get a decision in the Red Sox’ 2-1 victory over the Mariners at Safeco Field, it was a win that owed a debt to him and Bill Hall, who hit his second home run in as many nights, breaking a 1-1 tie. But Beckett, with his 5 2/3 innings, 98 pitches, just one run on five hits and three walks, was the story. Given how Beckett struggled to start the season before going on the disabled list, it was a positive sign for a team that needs them. And he did that, with impressive feel for his pitches. It had been two long months of rehab and strength work and lots of waiting. And then, with his first pitch back last night, Beckett faced Ichiro Suzuki, not exactly an easy task. Ichiro made him pay in an extended first inning in which Beckett threw 26 pitches — while on a limited pitch count — to get three outs. Ichiro reached on an infield single, helped by a slight bobble by shortstop Marco Scutaro. After Beckett struck out the next two batters swinging, Jose Lopez hit a ground-rule double that everyone — including Lopez — thought was foul. The ball hit the chalk and went into the foul territory beyond third base, where a fan reached down and picked it up. The ruling was a ground-rule double, even though Lopez stopped halfway up the first-base line, convinced it was foul. But Ichiro kept running, crossing the plate for the first run of the game. Though Beckett’s command wasn’t always there, it was a strong outing, even if the competition came in the form of the offensively challenged Mariners. Beckett lowered his ERA to 6.66 and launched himself toward a second half the Sox hope will be far more rewarding than the first. It was surely rewarding for Hall. As the baseball landed in the second deck in left field, and he began circling the bases, the Mariners could have been excused for wondering why that home run wasn’t hit for them. Hall hit just two home run in his 34-game tenure with Seattle before the Mariners sent him to Boston. So it must have stung, just a little, to see Hall hit his second home run in as many days at Safeco Field, this one providing the difference in the game. It came leading off the seventh, demonstrating he still has a little of the pop that led to his fantastic 2006 season in Seattle, which led to a megadeal that has left him struggling to fulfill the contract and the expectations. The Sox scored their first run in the fourth inning, when Kevin Youkilis singled with two outs and Beltre knocked him in with a double, tying the score 1-1. The Sox had a chance in the fifth when Mike Cameron doubled and moved to third on an errant throw by left fielder Michael Saunders. Chone Figgins barely moved to cut off the throw, which might have caused the dugout fracas in the fifth, involving most of the team, after Figgins was removed from the game. But the Sox couldn’t get Cameron home, Hall, Kevin Cash and Scutaro failing with a man on third on no outs. The Sox left the bases loaded in the sixth. With one out, David Ortiz singled into the shift in right, then Youkilis delivered a double that had the misfortune of bouncing into the left-field bullpen, keeping Ortiz at third. Beltre was walked intentionally, bringing up J.D. Drew. That was when Ortiz went to sleep. The designated hitter got caught off third base by catcher Rob Johnson. Though Drew walked, Cameron struck out swinging. Ultimately, though, it didn’t matter. Beckett pitched well enough, with an assist from from Scott Atchison (four key outs), one more perfect inning from Daniel Bard, and only a momentary hiccup from Jonathan Papelbon.